Can someone explain who/what reference is Mannimarco refer to "High King Alinor"? I tried to search the forum/internet for details but not sure. Is there any additional lore/information from the Summerset chapter perhaps? The High King of Alinor is merely the monarch of Alinor which is the "suzerain" city of Summerset, so to some extent, saying "the high king of Alinor" is like saying "the high king of Summerset"... It was Hidellith before Ayrenn, at ESO time. No idea of who it was during the Alessian thing though. Which is interesting, because it is phrased in such a way that pins the blame for the Planemeld on men. Mannimarco's treachery is ultimately the cause of the Planemeld, but it could be said that men are responsible since the other four Companions (a Nord, a Redguard, and two Imperials) are all men and committed the folly of playing with forces greater than themselves in an attempt to make Varen Aquilarious into a "Dragonborn". Indeed it's hard to tell how the high king of the Altmer could be part of this. 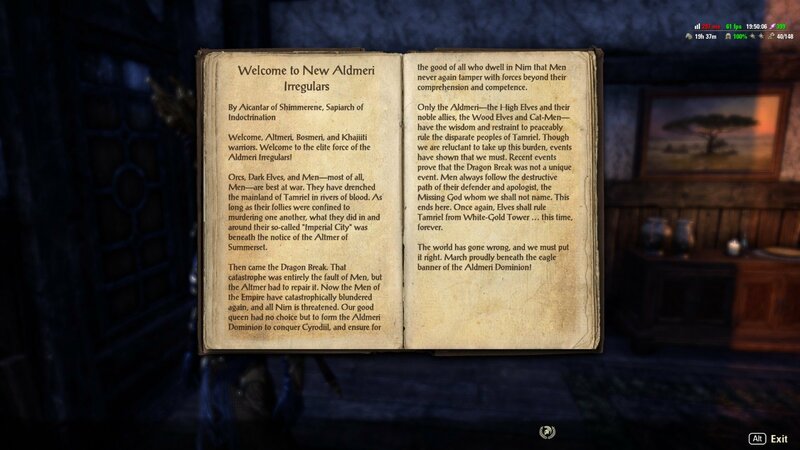 Maybe it's implying the Altmer provoqued the Alessian (by insisting about Auri-El primacy over the cyrodiils, as a ayleid god), having them to react by "re-writing" the god as a dragon/mannish god. That would explain that Mannimarco (as an enemy of Auri-El's law) and his minions befriended with the Marukhati (which are Divine extremists, not necromancers at all) : one common enemy. During the crisis, the Crystal Tower was forced to give the Thalmor greater power and authority. Their efforts almost certainly saved Summerset Isle from being overrun. They capitalized on their success to seize total control in 4E 22. They renamed the nation Alinor, which hearkens back to an earlier age before the ascendency [sic] of man. Most people outside of the Aldmeri Dominion still call it Summerset Isle, either out of peevishness or ignorance. This passage is referencing the Middle Dawn, an event that happened in the First Era long before ESO. Not sure if we know who that High King was, I guess it's possible it was Ayrenn's father. I don't know why Mannimarco blames the High King of Alinor, when it was an Alessian Akatosh cult that caused the event in the first place. "There's an old Orcish saying about shields. I don't remember what it is, I'm just saying. There's an old Orcish saying. Buy a shield." Given that the lore book you reference is talking about the Dragon Break in Daggerfall, it may also be referring to King Reman Karoodil of Firsthold, who marries Morgiah as part of Morgiah's deal with Mannimarco in Daggerfall. Admittedly, that's Firsthold on Auridon, not Alinor itself. But I don't think we have any details about a king of Alinor having anything to do with the plot of Daggerfall otherwise. Keep in mind that the event Mannimarco is reffering to the King of Alinor being able to tell us about -- the Dragon Break called the Middle Dawn, which happened in the late 1st Era -- takes place hundreds of years before the events of ESO (in the sense that a Dragon Break can be said to "take place" at a definite time period at all). We don't know exactly who ruled the High Elves then, or exactly what Altmer political arrangements were like then, so it's hard to say with precision who Mannimarco is talking about. Ok thanks for the comments and answers. I was thinking myself of a title, because it is not common in Altmer (as far as I understand and know) for a “high king” position. As for myself, I was here and there and here again, like the rest of the mortals during the Dragon Break. How do you think I learned my mystery? ...(in the sense that a Dragon Break can be said to "take place" at a definite time period at all). It is also possible that said, "high king," was another fluctuating element in said Dragon Break, and thus impossible to identify after the fact. Actually what makes me curious, is the Soulburst event in ESO (2nd era) can be considered also as a Dragon Break. Is it true? Below is a reference I got randomly when I was doing my quests. Greetings, my knowledge of the lore is limited but I'll try to help. “So could the High King of Alinor, who was the one who broke it in the first place. "He then ascended to heaven in full observance of his followers so that they might learn the steps needed to escape the mortal plane"
Hopefully someone can add onto this. Edit : english isn't my first language so I had to change one word. Sorry for the potential mistakes.